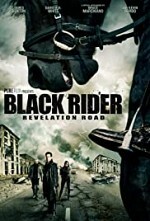 Watch Revelation Road: The Black Rider: The rapture has come and gone! In this third installment of the Revelation Road saga, the beleaguered mayor sends Josh McManus on a vital mission to find the mysterious and elusive "Shepherd." With the aid of another survivor, can Josh find the man - and determine if he's a prophet or a pariah?